Headbands are a great way to bring personality to any hairstyle. There are so many different headbands to choose from to fit your look for the day. There’s headbands ideal for formal attire, nature themes, glamorous themes, colorful designs, and even headbands with different sayings. Athletic hands bands are great for those interested in sports attire. This list will help you find unique headbands to add more style to your look. Sometimes consumers like to buy headbands with a certain logo just because they’re popular, and that’s okay too. There are many different types of headbands to choose from. Elegant headbands are those with diamonds, glitter, gold or silver. These are great for date night. An elegant headband will give you some extra glam to enhance your look. Beach headbands give off a bohemian vibe. Think of these as cute leisure headbands. Bright colors, whites, blues, pinks, orange and yellow are popular colors for this type of headband. These are perfect for the summer and vacation days as well. The perfect leisure headband that still allows you to look stylish. Professional headbands are a large category of headbands. The main thing to consider is whether your boss will have a problem with you wearing the headband. These headbands should be fine in the corporate or work world. They may be sparkly and elegant, or they might be plain. As long as they’re not too comfy and low maintenance then you should be okay. Think of a nice shiny slick black, or brown headband that will tie their hair back without causing too much of a distraction. The comfy headband may be the most popular of them all. This is the cheap headband you get from a department store or dollar store. This headband is for those days when you're stuck in the house. Maybe you have chores to keep up on, work to do around the house or just relaxing at your leisure. The comfy headband is perfect for these occasions. They’re usually a solid color and are made from cotton and other soft materials. The comfy headband may take up 2-4 inches which is fine when you’re not using the headband for beauty purposes. These are some of the most unique and brilliant headbands for use on any occasion. From formal dinners to a night out with the girls these headband styles have you covered. Many know that the best headbands can often time be found online where all the creativity is. Some of these headbands have intriguing patterns while others have sparkles and glitter out of this world. This is a super trendy and retro styled headband. The width is about 3 or 4 inches with a sleek knot on the very top of the headband. These are great for leisure, vacation, a day at the pool or a day at the gym. You’ll look stylish while wearing it too. They come in different colors and patterns, so find one that suits you best. These headbands have a larger width than regular headbands. They cover approximately 3-5 inches of the head. Some people would rather have a smaller headband, but these are very fashionable since they have awesome designs. Go for a tribal pattern or use bright colors to make the headband more noticeable. These are perfect for bad hair days and leisure activities. This isn’t the average headband. In fact, it’s a bandana. These come in all sorts of designs from the regular pattern that bandanas come with to unique colors and designs to make any look stand out. To some, these look better than an actual regular headband. Some of these products also come with ties in the back to make it look like the headband is tied down. These headbands are always super flexible. They won’t come in as many colors and designs and other headbands but that’s because fashion isn’t the purpose here. There are created to keep hair and sweat out of the face during a work-out. If you look hard enough you might be able to find a yoga or work-out headband with a cute design. These are perfect for weddings. 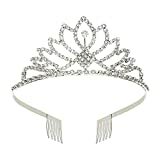 Crown headbands are bedazzled with jewelry on top of the band. They might be simple or come in intricate beautiful patterns. Some of these are affordable while some cost a little extra. It all depends on the retailer and brand you choose. They’ll match an elegant flowing dress to give you the look of a goddess. Some of these headbands also have a band that covers the whole head with jewelry, golden flowers, and other metal accessories added on. Other reasons to use one of these are, baby showers, nights out with the girls, formal dinner parties and ballroom dances. You’ll be the light of the room when pairing a crown headband with the perfect hairstyle. These are a fairly new trend. 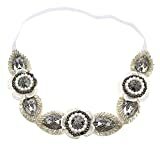 Beaded headbands come in different designs and types of beaded patterns. Some are made for casual use while others are perfect for formal events and occasions. Some of the most beautiful beaded headbands are bedazzled with jewels and beads alike. These are great for dinner parties and events of that nature. You can also find beaded headbands that use colorful beads which are less formal and great for everyday wear. A lot of the time these headbands will be created by hand to make intricate designs. The most common place to find these kinds of headbands is Etsy. These go over the circumference of the head. They’re usually placed halfway between the eyes and top of the forehead. These give an oriental look. Cultures in the Middle East and Asia often have headband jewels similar to these. Some use mostly diamonds or pearls while others use a band with dangling accessories over the head. These are great for weddings and festivals. Some people like to use them for everyday use if they want to look glamorous. A regular turban sits on top of the hair and covers the entire look. This is another Middle Eastern look. 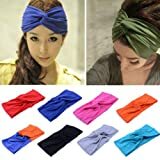 Turban headbands, on the other hand, cover part of the head just like a regular headband. These are usually created with one solid color, durable fabric, and bows for a unique design. These can be used for kids and adults. Some turban headbands do have designs as well. They’re usually elastic and considered Gypsy Scarves. This is one of the most unique headband designs. They’re great for everyday use. You can even use them to work-out in if desired. These are usually used by teenagers and young people. They are by far one of the most popular kinds of headbands. These can be picked up at dollar stores, department stores, and drug stores. Plastic headbands are great for everyday use at work or school. They’re not too large so they won’t stand out too much. Many plastic headbands are lightly colored. They also come in sizes for young children as well. This hairband has become a firm favourite with football players and other athletes. These headbands have tooth-like features similar to a super small comb. They’re designed to brush hair back and keep it tightly secured. They come in both metal and plastic. These are generally found at the same places you’ll find plastic headbands. Made with 100% acrylic; measurements: 9.75" x 4.0"
These are perfect for winter months. They’re usually made with a warm soft fabric which promotes keeping warm on and around the head and ears. Knit headbands come in many designs and colors. They usually come in white, brown, maroon or black. They also come with knitted designs and sometimes even sparkles. You’re likely to find these online and inside of department stores. Buns and ponytails may be the hairstyles you automatically think of when using headbands. Headbands are great for any hairstyle. Whether you have French braids, regular braids, twists or leave your hair down a headband will work just fine. 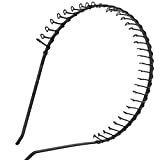 Plastic and Toothed headbands are most easily used on straight long hair. This is because of the teeth of the headband. If the hair is very curly the teeth won't go through smoothly. Plastic headbands usually will not cover curly hair either. Try using larger headbands and headband turbans in super curly hair. This way the hair stays back completely. Athletic headbands are good for any hairstyle at all. You can even use them while your hair is down. No matter how curly your hair is an athletic headband should hold just fine. Elegant headbands with jewels or crowns look best with hair pulled back in a bun or an updo. These headbands are so intricate that puffy hair won’t be tamed. Just pull naturally curly hair into an updo and use the headbands like that. If you’re that person who collects tons of headbands and has nowhere to put them consider this tip. Get a large Mason jar and hang all your headbands off of it. We all know that annoying feeling of the headband slipping down off the head various times through the day. Consider placing bobby pins under your ponytail or above to help keep the headband up. Use lightly colored bobby pins to pin down the front of the headband if you want them to blend in. It’s always a good idea to keep the headband toward the hairline so that it’s not very likely to slip. If that doesn’t work, use a hairspray with a sticky texture to keep the headband in place. When wearing an updo pick a thin, elegant headband. A nice headband with sparkles, silver or gold will fit nicely. Ponytails and buns can be used for any headband depending on the look you’re going for. Sportswear headbands are best for buns. Large sports headbands work the best since the goal is to keep hair pulled back and out of the face during a work-out. Headbands look great on a variety of hairstyles. High ponytails, low ponytails, French braid and even curls. Create curls in short or long hair for a super cute style. Use a patterned or glittery headband to top the look off. Braid two cow-girl braids in the hair with a half-moon headband on top for a country chic look. You can also use two pigtails on either side for the same effect. Glamorous headbands call for elegant hairstyles. Braided updos, complex braided buns, and twists are perfect for these headbands. Designer headbands are great for those who don’t mind spending some extra money on the top luxury brands. You may be surprised to learn how many luxury brands offer headbands. Brands like Gucci and Chanel come out with their own headbands. Expect to pay a large amount for these headbands. Gucci has a headband sold at Nordstrom. This is a sports headband that will collect sweat while you keep it stylish with Gucci. You can find this product on Nordstrom’s website. This headband is white with gold Gucci letters. There’s another variation to this headband in red Gucci letters as well. Silk headbands from Gucci feature a patterned style. The golden Louis Vuitton headband is only available on their website. You’ll have to make an inquiry to find out how much it will cost you. This headband has a brown-gold color scheme with the LV logo sitting right on top. Dolce and Gabbana have some of the most extravagant headband styles on the market. Their headbands are shaped like crowns with gold and silver covering the top of the headband all the way around. These headbands come at a large price too. If you're wondering what this headband looks like head over to the Dolce and Gabbana website. Some brands are known for selling great headbands. Underarmour and Nike for examples provide sportswear headbands that everyone loves. Lulu Lemon does as well. Junk Brands offer a wide selection of headbands. The majority of their headbands are for leisure use with many designs and colors included. They have a little something for everyone. Their headbands are pretty large in width covering at least 2.5 to 4 inches. Junk also offers headbands with country flag themes including Japan, China, England, and Russia to name a few. Supreme offers the ultimate sweatband for men. These are great for intense workouts. Men won't have to worry about sweat dripping down their face or getting into their eyes. The Be Brand offers beautiful headbands at amazing prices. Their patterns are a work of art. They offer a variety of different patterns and at least 20 different styles. Tribal patterns, flamingos and nature designs are just some of their most popular patterns. Take a look at The Be Brand company and see for yourself. Natural Life has headbands which can be used in a variety of different ways. These stylish headbands can be used as neck accessories, hair ties, and bandanas. The fabric is easy to maneuver around the head and anywhere else. These are considered Boho headbands, which have a beach theme. These will work great for vacation, festivals and leisure time. Children love headbands and they’re necessary to keep some of those pesky flying hairs at bay. Stores like Claire’s and Justice have the perfect headbands for children. They’re both affordable and stylish. 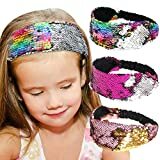 Retailers such as Target, Walmart, Kohl’s and Children’s place also offer great headbands for kids. Children love bright colors and cool designs. A headband will make your child look even more fashionable and cute, especially if it matches her outfit. Headbands can top off any look. There are so many different colors and patterns to choose from. Choosing the right headband can give you a totally new look. Headbands can be used for pretty much any occasion. There’s something out there for everyone. The most unique styles are usually found online through private retailers. No matter which looks you choose, you can always find a headband for a decent price.